The award ceremony for 2016 recipients of decorations, medals and certificates of merit from the Macao SAR government was held today (6 January). 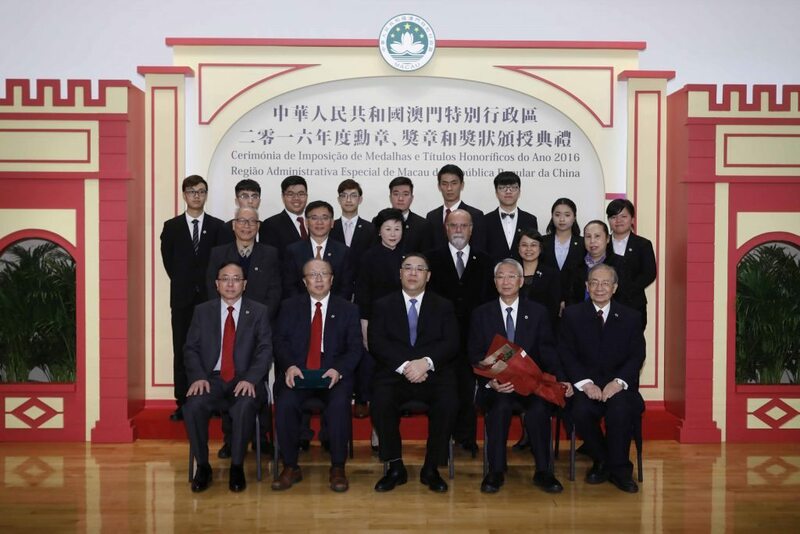 The University of Macau (UM) received the Medal of Merit—Education, in recognition of its outstanding contributions to education. It is the first higher education institution in Macao to receive this honour. Additionally, four UM members were awarded by the SAR government, for their personal achievements, contributions to society, and services to the local community. The award ceremony was held at the Macao Cultural Centre. Chief Executive Chui Sai On presided over the ceremony. UM Rector Wei Zhao received the medal on behalf of the university. UM is grateful to the Macao SAR government and society for their support. It is also appreciative of the hard work and long-standing support of its alumni, which has brought honours for the alma mater. With great buildings and great professors, UM is committed to providing a multifaceted education to the students through a unique ‘4-in-1’ model of education that consists of discipline-specific education, general education, research and internship education, and community and peer education. UM believes that receiving the Medal of Merit—Education shows local recognition of the efforts of its faculty members and students. In the future, UM will continue to work hard in order to scale new heights in teaching, research, and service. The four UM members awarded by the SAR government are Lei Pui Lam, vice chair of the University Council (Decoration of Honour – Golden Lotus); Leong Lai, member of the University Council (Medal of Merit – Education); Cândida da Silva Antunes Pires, emeritus professor from the Faculty of Law (Medal of Merit – Professions); and Maria Helena de Senna Fernandes, UM alumna (Medal of Merit – Tourism). UM members who attended the ceremony included University Council Chair Lam Kam Seng; Vice Rectors Lionel Ni, Rui Martins, and Kou Mei; Communications Office Director Katrina Cheong; and representatives of UM alumni, faculty members, and students.